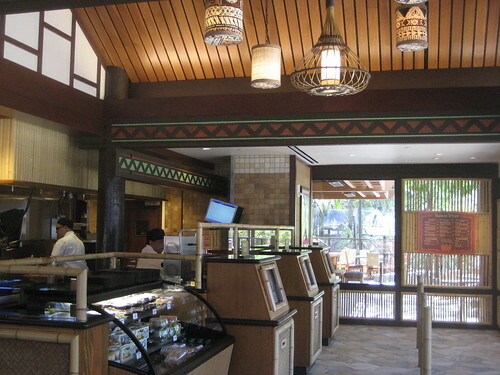 The Disneyland Hotel recently remodeled and re-themed the pool and dining area in the center of the property, with last summer bringing the opening of Trader Sam’s Enchanted Tiki Bar and Tangaroa Terrace. 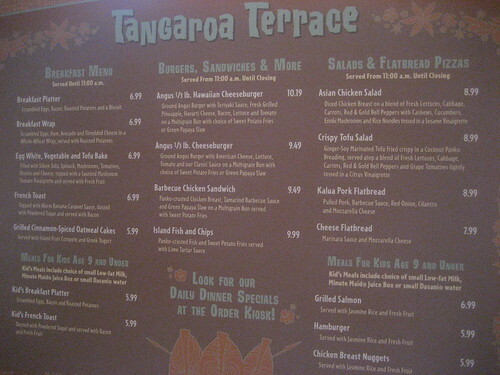 The latter is a quick-service restaurant named after the tall tiki tree in the waiting area of the Enchanted Tiki Room at Disneyland. The A-frame edifice features a sign with spears and three colorful masks as well as two large tiki columns carved by Leroy Schmaltz from Oceanic Arts. 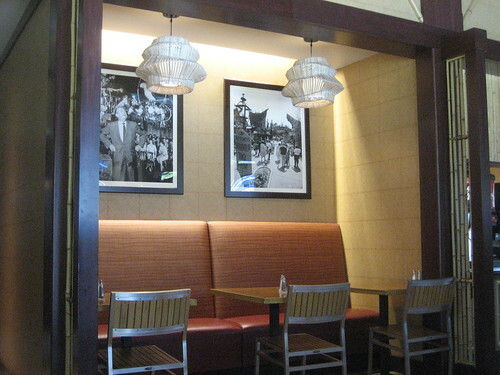 The inside has a sleek look that’s accented with tapa and rattan lamps, bamboo and lauhala matting, and black-and-white vintage photos of Adventureland and Walt in the Enchanted Tiki Room. Diners order at three touchscreen stations and then pay at the cash registers off to the left. Drinks, desserts and grab-and-go items like pineapple-macadamia nut muffins are set up at other displays nearby. Breakfast options range from french toast with banana-caramel sauce to a healthy-sounding egg white and tofu bake with spinach, mushrooms, tomatoes and cheese. After 11 a.m. the menu features burgers, panko-crusted fish and chips, cheese or kalua pork flatbread, and a couple of salads. 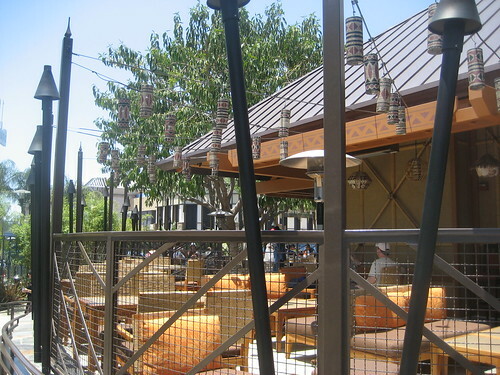 There are also rotating “Island Plate Dinner” specials like miso-crusted salmon, chicken katsu and tamarind-glazed pork shanks. 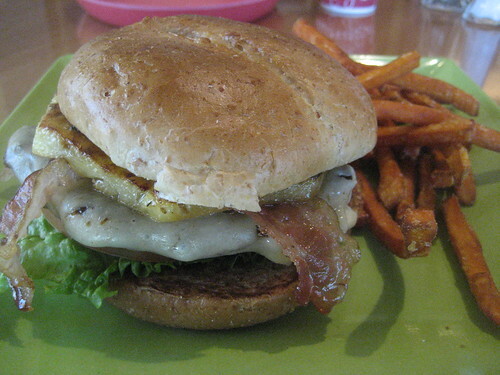 The Angus 1/3 pound Hawaiian cheeseburger ($10.19) comes with grilled pineapple, teriyaki sauce, Havarti cheese, lettuce, tomato and a sad excuse for bacon on a multi-grain bun. The toppings are key to distracting from the fact that the beef is served well done. The Disney Parks may be a little late to the sweet potato party, but some of their restaurants have started abandoning regular fries in favor of these trendy tubers. 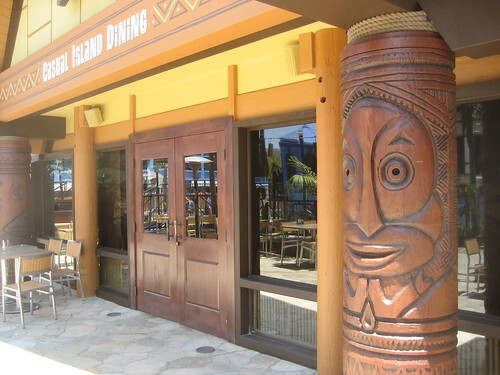 We used to fuel up on food here before going to Trader Sam’s, but they’ve since added some of the same dishes so you might as well head straight to the bar. 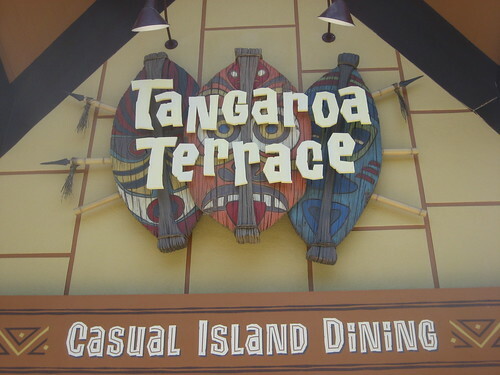 It’s worth taking a look around Tangaroa Terrace, but I’d only recommend eating there if you’re looking for a quiet meal since it’s usually pretty deserted. 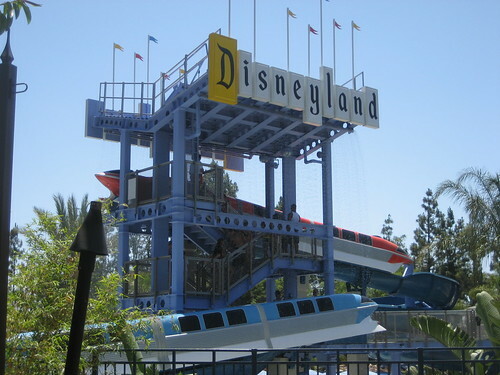 The large shared patio overlooks the Disneyland Hotel pool and its Monorail waterslide. It may be quite tempting to enjoy the pleasant setting when the weather’s beautiful, but I’ll say it again — just go next door to Trader Sam’s.